Help the public obtain the information they need. Since the public relies heavily on Government-related information for research, and a myriad of other tasks, each government agency should shape its online presence around specific keywords, which are based on what the user searches on the search engine. When a user inputs a word or phrase into a search engine, it returns a list of websites it believes are relevant to what the user is looking for. Issues arise when users are looking for Government-related information, and the government website does not have any keywords within it telling the search engines it is of high value to that user. Keywords should be as specific as possible to the information that a user would be looking for on a particular page. For example, if someone is looking for small business grants from the government, he/she may type “business grants” into the search engine. Business grants should come up on the first page, and since government sites are considered more trustworthy than others, the government sites should show up first. In reality, the page may be filled with general grants or grant information by non-government related sites, thus not giving the user what the user was looking for. Once keyword research has been done to decide what users are typing into the search engine, the site can be set up with these keywords, and a specific page within the .gov site should show up with specific information related to government business grants. Keyword research is the foundation of Search Engine Optimization (SEO). 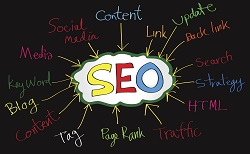 Having a sound keyword strategy allows specific keywords to be mapped to content, so search engines know what keywords the website should be ranked for. In order to perform proper research, a tool such as Google Adwords Keyword Tool is needed. With this tool, choose keywords with high volume which indicate the user is looking for the webpage. Once these have been chosen, the next step is to have the webmaster place the keyword within the content a few times and in a particular piece of code called Meta tags. Once search engines recognize which keywords should be associated with the webpage, it will rank the government website for those particular keywords. Since government websites naturally have authority over other websites on search engines they generally rank higher, thus giving users exactly what they are looking for when searching. By Stephanie Stover,**** Search Engine Specialist for vocational college Brighton College located in Vancouver, B.C.